I am not one for ‘health foods’ or self-enforced dietary ‘requirements’, I steer clear from trendy health regimes and stick to food that just tastes good. But I recently stumbled across a fad that was just too intriguing to pass by – aquafaba. Aquafaba meringues are a great example of why you shouldn’t believe everything that the internet tells you; after scrolling through countless pictures of cute little tarts topped with crisp and egg-free meringue, I thought I was on to a fool proof new dessert. It appears I was wrong. First step – drain the liquid off of a can of chickpeas and eat the chickpeas for lunch. Next, whisk the brine until it forms firm peaks, like you would if you were making meringue in an ordinary universe. Surprisingly, it works – and as the liquid plumps up with air bubbles, the salty flavour seemingly evaporates. A tray of sticky sugar syrup, amber in colour and bubbling at the surface. I don’t know if I hadn’t beaten the aquafaba long enough, or hadn’t added enough sugar. Maybe it can only be used like Italian meringue, or maybe the internet had lied to me. If anyone can help me with my vegan-induced dilemma, I am all ears! So, this week I moved. I packed my bags and hopped on a train, how exciting! However, before this excitement could happen I had to leave my house, which involved finding a way of using all the ingredients I had that I couldn’t or didn’t want to take with me. The trouble with this was that I didn’t really have enough of anything to make anything, so I had to do some tweaking. So this is my adaptation of Vadani Kaval Gheta’s vegan lemon almond cake. I love lemons. 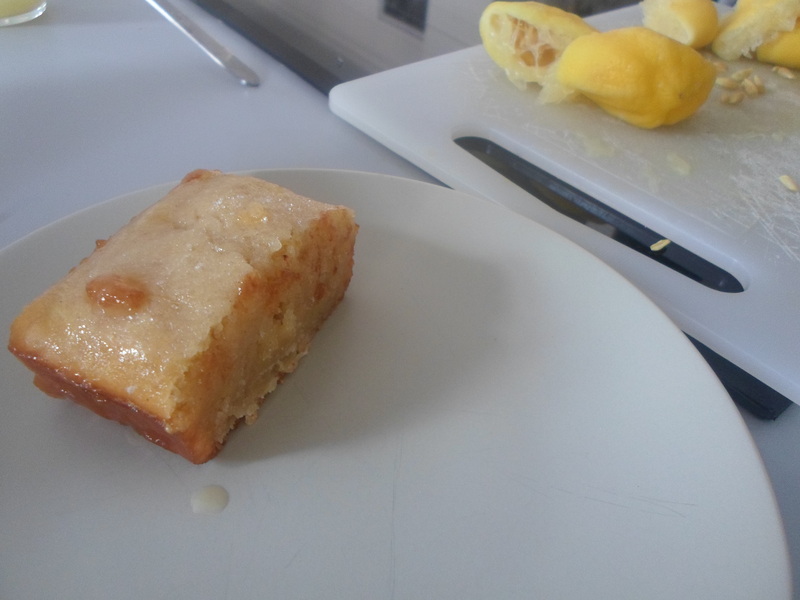 And a few years ago I made Nigella’s lemon polenta cake (very good, do try it!) and this cake is quite similar. Although unlike Vadani’s version of the cake, mine was not actually vegan… I had no soy milk, but I had normal milk and the only reason I had looked for a vegan recipe was because I had no eggs and I didn’t want to go and buy any. So I did what I could with what I had, when life gives you lemons, bake a cake! 1/3 cup of oil, from an olive, a sunflower etc. First things first, zest all the lemons that you choose to use, squeeze the juice out of them all and add half of it to the milk, set the other half aside. Leave the milk to curdle a little, which I know sounds gross but it helps to thicken the mixture later on. Mix the almonds, the flour, the baking powder and the salt in a bowl and set aside. 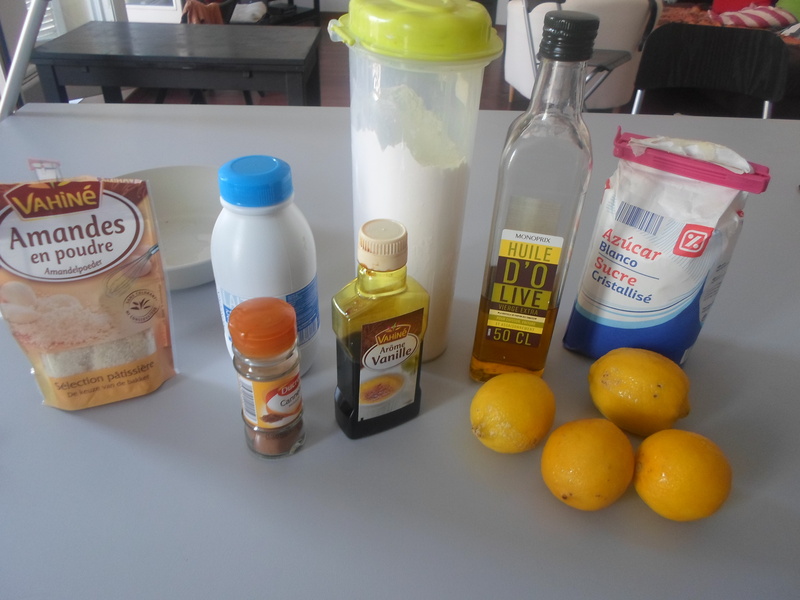 Mix the oil, the sugar, vanilla and all of the lemon zest in another bowl, you can blend it if you want but I didn’t, I doubt it is an essential step. I also added a little bit of cinnamon. Add a third of the milk slowly and mix it in thoroughly, add another third and another third like so. Add the dry ingredients and mix together, again thoroughly. Then pour into a cake tin and pop in the oven (which you should have heated to 190°C before the first things first) for 20 minutes. While that’s baking, mix the remaining lemon juice with a little bit of sugar to make a nice glaze, you can heat it to thicken it up if you would like but what I did was wait until the cake was done, I took it out of the oven and poured the sugary juice straight over the cake and put it back into the oven for a couple more minutes at a low temperature. This way it seeps through the whole cake to keep it nice and moist. This cake was a success in my opinion, although it didn’t make a lot and I ate it within the hour. It is best enjoyed hot I think! The sugary almond base to the cake is nicely contrasted to the tart flavour of the lemons which I adore! A very easy cake, almost as easy to bake as it is to eat!